I am in love with Starbuck's Peppermint Mochas but at 4.55 for a small we had to break up. I nearly died when I went in and ordered one the other day and that was my total. Wow, have prices gone up. So I just got to goofing around here one day and made my Poor Man's White Chocolate Peppermint Mocha Latte version. It is so good! 1. First, take a few of those Hershey's White Chocolate Peppermint kisses and drop them in the bottom of your mug and pour your hot coffee in. 2. Then add some sweetener and some creamer and mix well. I had the Mounds flavored CoffeeMate. 3. Top with a dollop of whipped cream and sprinkle with some crushed candy cane. Now doesn't that look yummy? Yummy... Too many calories for me. I'm having trouble staying away from all the chocolate..
WOW, Elaine, that looks delish! and warm! Happy Sunday. Yum, great idea! I'll have to try that! Sounds very yummy! Certainly will give it a try. Have a peppermint filled day!! Ho Ho Ho is right!! I an in love with that Santa mug too!!! I know, Starbuckss has gone up so much, that for us now, it is a treat for once in a while. Yours comes to a close second!! Love the mug! My mouth is watering ... I want white chocolate peppermint Mocha Latte!!!!! Good for you! I wish I could make my favorite drink at home, but it's Frozen Coke and I don't think we could buy a machine! I don't like coffee, but I want to learn to like it, so I can get the caffeine without the calories. That does look very yummy. I should see if I can't make the Peppermint Mocha, it's my favorite Starbuck's drink. That mug brings back childhood memories! Very cute. Love the hot chocolate recipe. I'll have to try it! Might have to do this for the hubby! Sound pretty tasty to me. I love coffee and I am sure this would have been great. You made my day! I'm addicted to those Peppermint Mochas, but like you, the price is a killer (& and I don't get by a Starbuck's often). I just happen to have a few of the peppermint Hersey's in the freezer, so I'm off to make a fresh pot of coffee and find my Christmas cup. It really does look yummy! Do you know that I've never had anything from Starbucks? I'm too cheap, plus I only have one cup of coffee in the morning. Any more and I get bajiggety! Happy Christmas and Merry REDnesday! I do not like white chocolate, but Shanley Belle would absolutely love this. I am going to try and make it for her this afternoon. Thanks for posting the recipe. Delicious! You are one smart girl coming up with your own recipe! I like all the fancy drinks, but...YIKES! They are so expensive. I have discovered a great Chai Latte recipe. It tastes just like Starbucks, too. I place one Bigelow Vanilla Chai Tea Bag in a mug of hot milk and sweeten it with Stevia. I leave the tea bag in my cup and enjoy for a fraction of the cost! I use unsweetened almond milk but any kind of milk is fine. Yes it does look yummy and I have the same love for coffee that you do! 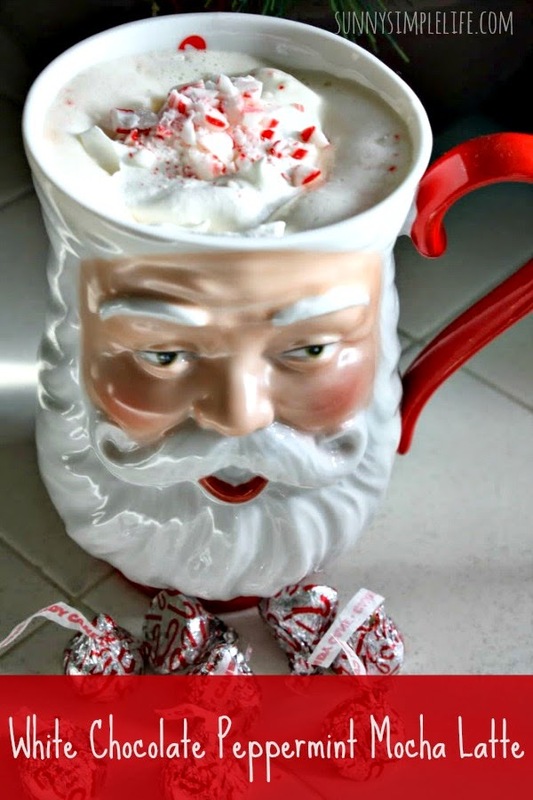 I just discovered those candy cane kisses over Christmas and added them to my coffee and hot chocolate, too!! Your mug of goodness looks wonderful. I agree with you on Starbucks. They are all around us here, but I only go with a gift card or when leaving out on a long trip--something special! Thanks for linking up with Foodie Friends Friday! Looks yummy. Hope you come again next week. This sounds so festive and delicious. I'll have to give it a try. I'd rather make my specialty coffee at home. Thanks for sharing with Foodie Friends Friday this week. This is so yummy and I picked it for my host favorite on Foodie Friends Friday. Thanks for linking up and I hope that you will join us again this week. This recipe is featured over at the Daily Dish Magazine. Sorry for being late in telling you. I would probably react the same way. We rarely have a cup of Starbucks coffee nowadays and we just bring our own. Once in a while though , it is nice. This so yummy! I will try it soon. Thank you for sharing at #Bloggerspotlight link party, hope to see you again! Pinned! This looks wonderful, thanks for sharing with us at Mommy Monday!